It has been a bit of a full-on week for me this week - chicken pox (son #1), close family member had a stroke (thankfully mild but still a shock) on Tuesday, kindy class art work due on Thursday for the annual art show fundraiser (I painted red accents onto 21 little darlings drawings of the Cat in the Hat) and so on - I won't bore you with all the details. So now after the weekend I am well and truly ready for my bed. 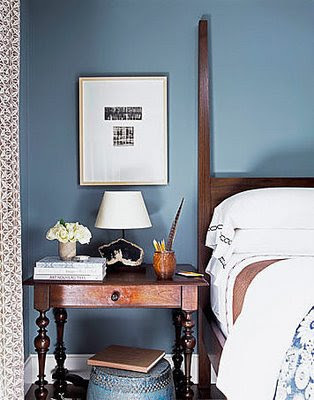 Love the turned legs on the side table and the Shaker-esque bed head. I know in the real world our side tables are not this beautifully styled - but it is still nice to enjoy them. 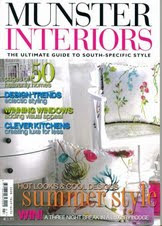 Off to my water glass, pile of interiors mags and books, my glasses and bedside lamp then. As a parent I know I sometimes wonder how much I impose my style on my kids surroundings will impact their own style. 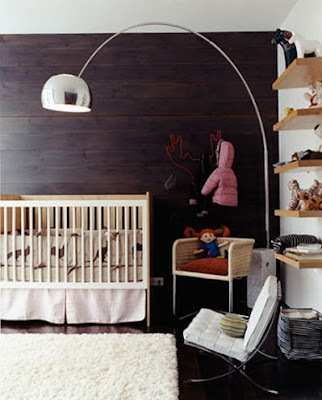 I smiled therefore when I saw this kids room by Meyer Davis via Desire to Inspire as, surely this is the bedroom of a future design blogger ? Joking aside, I like the panelled wall and the cream and brown colour palette and the shelves and mini chairs are both interesting and practical. 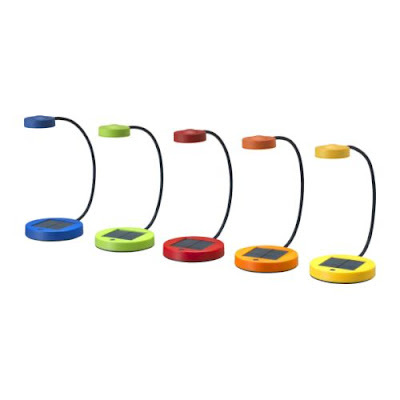 Not sure how well the Arco lamp would survive the toddler years but each to their own !! 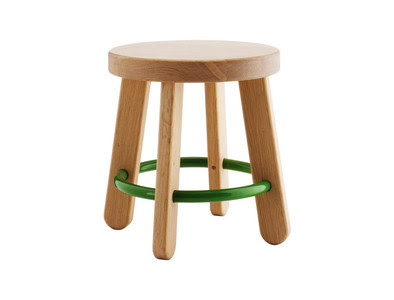 The very tasteful and fun furniture below is in the same vein and comes from Habitat in the UK. 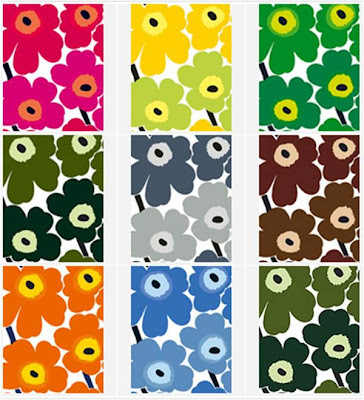 I have always loved this iconic Unikko fabric by Marimekko but only recently researched it as part of my studies. 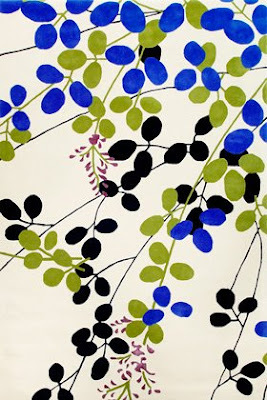 It was designed in 1964 by Maija Isola who then went on to co-design fabrics for Marimekko with her daughter Kristina Isola. Now as Maija has passed on, Kristina, who still works with Marimekko, is responsible for curating the design, choosing new colourways and applications. 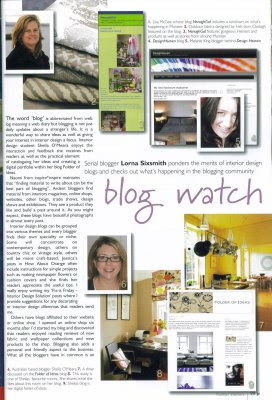 A little while ago I was invited by the lovely Lorna Sixsmith at Garrendenny Lane Interiors in Ireland to feature in an article she was writing on design blogs for Munster Interiors. 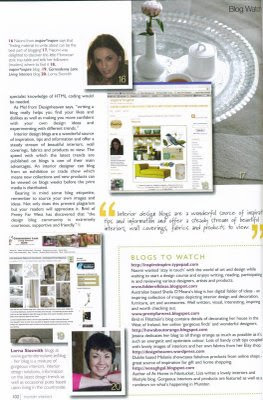 I was delighted to take part and Lorna produced a fine article. Ireland has four provinces and Munster is the southern quarter so I suppose it is the equivalent of appearing in 'South Australia Interiors'. 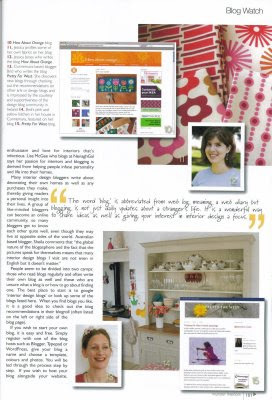 Anyway I was pretty chuffed to be included with some great blogs - Inspire Inspire, Pretty Far West, How about orange, Design heaven and Nenagh Gal. 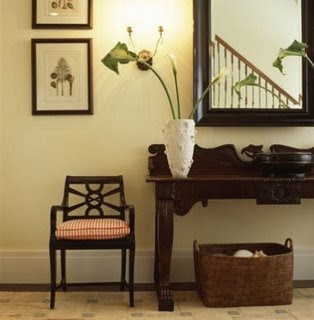 Welcoming + interesting + organised = my ideal hallway or entrance. The table and chair here are detailed attractively and otherwise all is simple and elegant. Looks like there is a bit of symmetry on the right with a second plant. This is a company which is about to launch wallpapers for boys at 100% design in London. The Paperboy site is not up yet but this is one of the previews available. 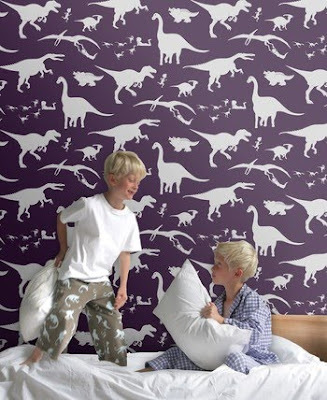 The aubergine is a very refreshing colour when it comes to kids interiors and I love the name of this pattern - 'dya-think-e-saurus'. 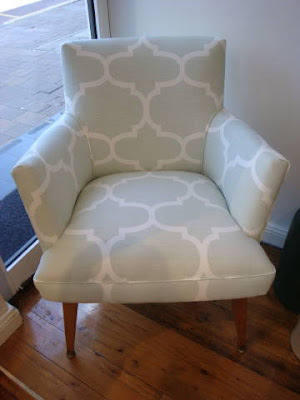 A little slice of elegance from Armchair in Crows Nest, this is the Arabella chair . . . 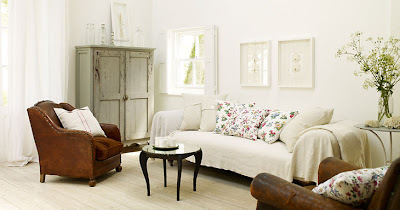 The Armchair specialises in renovating vintage chairs. 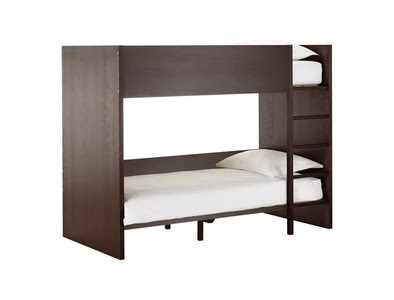 What sets them apart are the clever fabric choices and high quality upholstery finish. 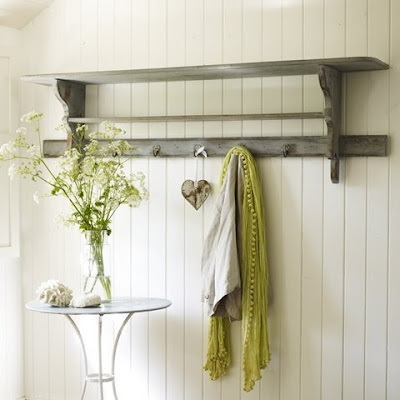 Time for a splash of colour - when I scroll down and look at a lot of neutrals and whites this week. 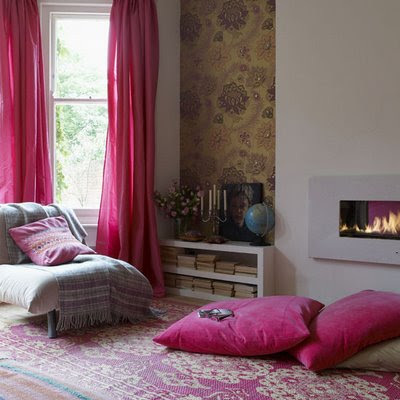 The deep pink here is a favourite of mine - a little goes a long way but it looks especially great on the velvet floor cushions. I also like the fireplace. A good friend of mine installed a very similar one on the wall in her kitchen with a shiny steel surround and it looked fantastic. It also made the kitchen into a real gathering point as she had a window seat and a round table between the fireplace and the stove. I don't normally go for glass topped tables but this I love. 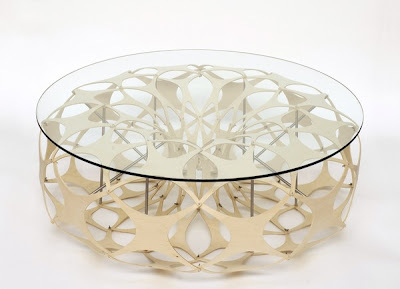 The base reminds me of David Trubridge's beautiful pendant lights - well, if one had been squashed slightly. I completely forgive the table it's glass top when you see the movement and shapes underneath. Only problem is I wouldn't want to put anything on it ! 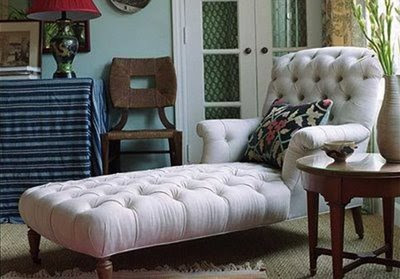 Some day I would like to own a chaise longue like this first picture. It looks so comfortable with its high back and snug arm rests - perfect proportions. I always smile when I see rooms with two chaises side by side as in the bottom picture. There is something very luxurious and intimate about having a sitting room designed for two - it says to me - we are going to suit ourselves here, just the two of us, nice and comfy side by side - to hell with everyone else !! Came across this UK based site which delivers on it's title admirably. 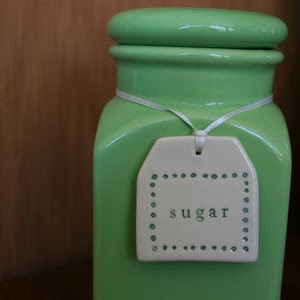 Pale and Interesting does what it says on the tin and have a range of muted furniture, homewares and vintage finds to delight the white lover. The mirrors below are all antiques and I especially like the fluted pie crust mirror. 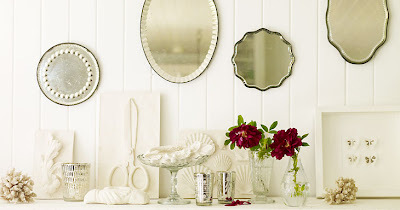 It's inspired me to go to the next antiques and collectables fair I see advertised to pick through the old mirrors. We are having the most fabulous winter in Sydney - we have had blue skies for most of the last four weeks - to the extent that I am wondering should I water some of my plants. I can't remember when it last rained. They are a great hit in my house and a good energy awareness lesson too I feel. RugUp was a (very short) exhibition of contemporary rugs designed by COFA Textile Design students on display at Government House from 30 July to 2 August. I was hoping to attend the talk tomorrow night on contemporary Australian rug design and manufacture but can't make it happen this week unfortunately. The panel will include Neale Whitaker, Editor-in-chief of Belle, in conversation with industry experts Yosi Ta and Harold Luke and designers Akira Isogawa, Julie Paterson of cloth fabric and Liane Rossler of Dinosaur Designs which would make for an interesting forum I reckon. Tickets via the Historic Houses Trust if you can make it. This rug is by Akira Isogawa and was featured in the current issue of Inside Out in a divinely renovated Paddington terrace. 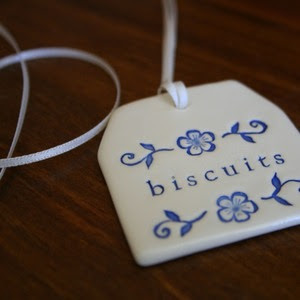 I am a big fan of Paper Boat Press - Kylie Johnson's ceramics and poetry. 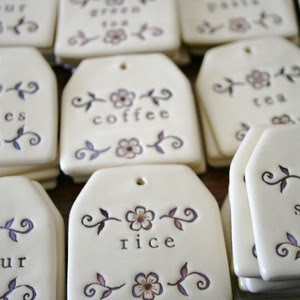 This is her gorgeous range of kitchen labels. The other news from her newsletter is that she is taking orders for personalised Christmas stars and that she is having a winter sale offering 25% of if you put WINTER in the discount box. So I'd better get on with clicking that buy button. 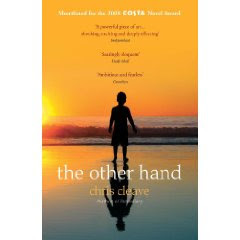 This is a slow blog - I am not very good at getting things posted quickly - more the tortoise than the hare. I attended Saturday in Design on the weekend and really enjoyed it. I will write about some of the shops and pieces that caught my eye - all in the fullness of time - but in the meantime here is a link to a fabulous post by Lucy at The Design Files which captures the mood and includes many of my favourite spots on the tour. So now thanks to Lucy I don't have to rush around and can direct you here.